Wow I want to have something sweet! It's killing me!!!! Ok maybe not killing me...but anyone that has gotten sucked into a habit of eating ice cream each evening, or a cookie after each meal, or really anything sweet that becomes a habit knows. They know that it becomes something your body really craves and wants! Big time!!! I'm on at least day three of no big sweet treat like that. Yesterday we ate at a place that has a big salad/fruit:/soup/dessert bar. (Hoss's). I actually did pretty well with my food. I had salad - small scoop of macaroni salad, four tortilla chips with cheese, a half cup of soup, one yeast roll and some cottage cheese. I really lusted after the dessert bar....bad. I drooled at the thought of the soft serve ice cream. But I knew that I needed to cut the sweet treat habit. So I grabbed a bit of fruit and called that my sweet treat! Victory!!! Admittedly, last night I really really really wanted some ice cream, or a cookie, or something sweet! Anything sweet really! I did not cave though!!!! I was thinking on Saturday morning about where I am and how my first week went. I had some victories for sure! **** I tracked...every bite....every day!!! ****I actually got an average of 60 ounces of water each day! (This is huge because I was struggling with even getting in a measley single 16.9 ounce bottle down the hatch!). **** I was extremely cognizant of my steps and I worked to really move more!!! So I had some great victories!!! **** While I tracked my food I wasn't exactly where I would like to be. I made better options for sure...but there is room for improvement....and I need to get my calorie count back down!!! **** I was cognizant of my steps and worked to add some into my routine...but I needed 38.5 miles if walking/self propelled activity. While I did walk 57,286 steps...that only made 25.28 miles. 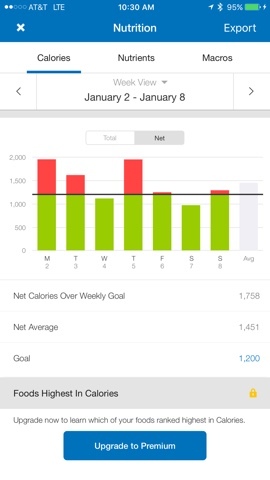 So I am 13.22 miles shy of my weekly goal. I know that a trip to the gym and an hour on an exercise bike will catch me up...or in the summer when I am riding I will gain some miles!!! So I'm not too concerned yet...but I have to fix that wee little deficit!! So....I finally worked up the final numbers for the year! Soooo I have to more than double my miles for the year 2017 in order for me to reach my 2017 miles! And I amhttps://www.fitbit.com/user/5B2VZ3 on fitbit! Breaking that sugar craving at a certain time of the day is hard, I know...I'm working through that very thing right now. It just takes me about a week, but it is a tough week, that's for sure. Good job not succumbing to the desserts at that salad bar restaurant! Good job resisting the sweets! Sometimes I feel like my cravings will kill me too. You're doing very well!!!!! Great job with the deserts at Hoss's! It's so hard when it becomes a habit! Keep up the good work!